One of the best things about having a travel blog is getting to document my adventures to share with others, and look back on myself. My travel section is packed full of my trips and all the photos I’ve taken – what could be better than that?! It’s like a living diary and I think the quality of the photographs are really important to this. No one wants to look back at blurry or dark pictures, and now that we have digital cameras built right into our phones, there is no reason to put up with them! Here are my six tips for taking travel photographs. If you’re not confident using a DSLR, you might be better off just using your phone camera for your travel pictures. After all, there is no point having a fancy camera if you don’t know how to use it, so if you don’t have time to master a new camera stick with what you know. One thing you might want to invest in, especially if you’re traveling solo, is a lightweight travel tripod. This doesn’t have to be expensive – a cheap one with bendable legs is perfect for attaching to trees in order to help you get wider shots and selfies. Sometimes to get the best shots, you need to crouch down or get up high. Looking from a different angle will give your photograph a different edge, so you need to give it a go. As long as it’s safe and appropriate, don’t be afraid to try a completely different angle and see how it comes out. After all, the pictures can be deleted so it doesn’t matter if it doesn’t work. Although taking pictures of big tourist spots is always on most travelers list, The Secret Traveler by 1Cover recommends looking for those magical places that are a little more off the beaten path where you can take more unique photographs without crowds of people. Instagram is another great place to find the best photography spots, so search for hashtags that are near where you are going and see where other people head to take the best shots. Again, if you’re traveling solo, remember that it’s okay to ask someone if they will take a picture of you. 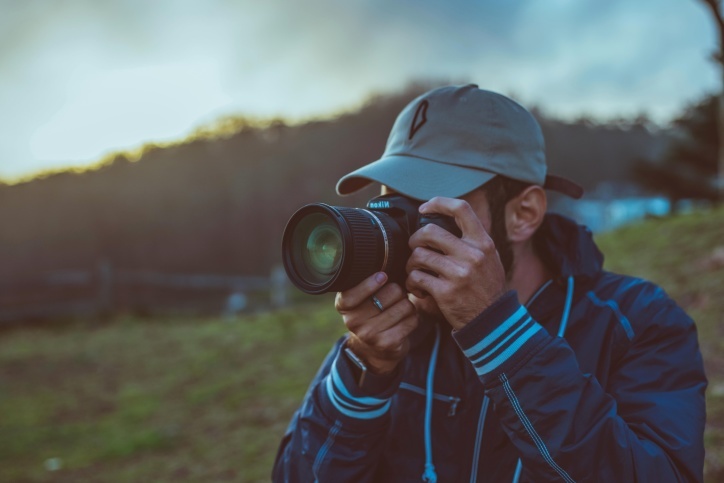 Try to look for someone who seems trustworthy, perhaps a family, or someone with a camera of their own as they will be more likely to take a good picture of you. When you are at an attraction, ask the staff, they are probably used to taking hundreds of shots every day and will likely know the best places to stand to get the perfect picture. Most of us are tempted to put our subject in the middle of the frame, however, what sets photographers apart is the ‘rule of thirds’. This is where you divide your image into nine even squares (a lot of cameras and even phones have this feature built in to show you the guides) and place your subject perhaps in the first third of the screen, or the bottom third – you’ll notice it really makes it look more interesting. There is a fine line between capturing memories and living through a camera lens and it’s important to be aware enough not to get them mixed up. If you realize you are focusing more on getting the perfect shot than really enjoying yourself, perhaps it is time to put the camera away and live in the moment a little more. Not every picture has to be perfect – in fact, some of the best ones tell a story but aren’t necessarily canvas-ready, and that’s okay. The most pictures you take, the most memories you will have to look back on and the more you practice, the better you will become! What are your top tips for travel photography? Let me know in the comments below!